Name Of The Book: Mom and I Love a Terrorist: Can Happen with a Man in Dark? 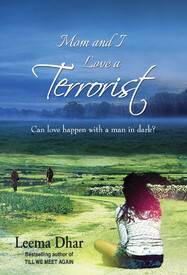 Book Summary of Mom and I Love a Terrorist: Can Happen with a Man in Dark? Oh! Come on mom. Till date, I don’t know where my father is! God knows where I should find him. After so many years, you gave me a letter, he has left to me. Where is he now? Why were you trying to hide the truth for so long? You slept with a black stranger when he came in the house as if it’s his own. He just came out of nowhere. Amaan has left me, and you want me to watch some poppycock here on T.V? You never answered me who the stranger was and why he stayed here for long. Kelly’s cry echoes in the sea. Kelly, girl with a thousand dreams, was happy with her mom in a distant Island, Andaman, till she turned nineteen. A dark night sudden entry of a black stranger in her life. Unanticipated, he shares her mom’s bedroom. Passing through sleepless nights and intense depression, she finds a secret diary that reveals a clandestine past, creating a tsunami in Kelly’s rhythmic life. Ricko, a Casanova, falls for her. She finds Amaan, the boat maker on the sea, the superman she needed. Will she be able to unfold her mom’s haunted past and her cryptic love? Do Kelly and her mom love the same man, the black stranger, a terrorist? Leema Dhar (born 1993, Allahabad), 2nd year student of Humanities in Allahabad University; completed her ISC from St. Mary’s Convent. She left her AIEEE for her creative passion. Her debut fiction, ‘Till We Meet Again’ is a National Bestseller. Her first anthology of Hindi poems was ‘Kuch Lafz Naqab Mein’ (2007), second in English ‘For the Hundred Tomorrows’ (2010). She was nominated consecutive second time for Hindustan Times Women Achiever Awards (2011 & 2012). This is her second fiction that’s thrilling yet has a pinch of romance in it. She’s currently working as a freelancer in numerous creative projects. Besides enjoying creativity, her interest lies in psychology, an avid reader of romance and thriller. She loves singing, painting and travelling and along with becoming a writer, she wants to be one of the finest travelogues. Her greatest inspiration has been the Andaman Islands, giving her an inexplicable life, the darker hue of love. Leema Dhar’s Second book, after reading this book i seriously doubt her age now, the writing is that of a mature person. She has been nominated for Hindustan Times Women Achiever Awards, which i believe she deserves to be. At this young age she has written two novels and both tagged as the National Best Seller is an achievement in itself. Well about the book as usual i will start of with the cover and the feel of the book, decent cover and the feel of the book is good in terms of the printing quality. Story no need to say is brilliantly written, with the characterization wonderfully portrayed. Description of Andaman and the pain of the characters could be felt. I could easily visualise Kelly many times and her cries echoing the sea. January 16, 2013 in Book Reviews. Tags: General Press, leema dhar, Mom and I Love a Terrorist: Can Happen with a Man in Dark?